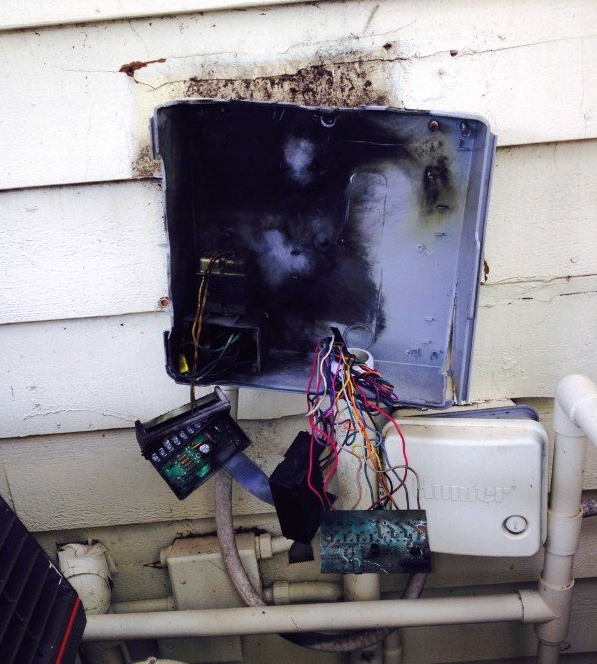 Surge and lightning damage to electronics is a frequent occurrence, particularly in the summer months. A recent analysis of 2016 homeowner’s insurance claims by Insurance Information Institute revealed that over $825 million was paid on more than 100,000 lightning claims. This represents a near 10% increase in the number of lightning claims filed in 2016 over 2015, though it is still below the 10-year average. Perhaps more significant for insurance carriers is the fact that the average cost per residential lightning claim has risen over 40% since 2007 (III), which is indicative of the increase in the number of electronics susceptible to lightning- and surge-related damages per home. This figure is expected to continue to rise as a growing number of homeowners install connected smart home components. Depending on the level of integration, home automation equipment can quickly become expensive to repair or replace. For smart home components assessed by our technicians for surge or lightning damage last year, the average cost to replace was nearly $3,500, and the average cost to repair was roughly $850. Lightning typically damages electronics in one of two ways. The first is a direct lightning strike to the home, which is an infrequent occurrence. A direct lightning strike will cause significant damage to electrical and nonelectrical items in the home. In many instances, this will start a fire, often in the wiring within the walls or the attic. It can also cause structural damage to the roof, chimney, or sometimes the windows or foundation (Storm Highway). Moreover, electronics plugged into an electrical system that receives a direct lightning strike typically cannot be protected by a surge protector. The more common scenario is for a nearby lightning strike to enter the home through wires or pipes that extend outside the home. The energy from a nearby lightning strike can travel through communication wires (such as phone, internet, or cable wires), directly from a utility pole into the home’s electrical panel, or through conductive metal (such as plumbing or metal bars in the foundation) (NWS). Damage from this type of event is generally less severe than that of a direct strike. The electrical system of a home or business is one of the most frequent points of entry of increased voltage from a lightning or surge event. When lightning strikes a nearby power line, it travels the path of least resistance from the power line to the meter and then into the home’s electrical panel. If the electrical panel is equipped with a whole-house surge protection device, the surge will stop there. If the surge is not stopped at the electrical panel, it can then travel over the surface of the wiring to the home, burning the insulation and fusing the wires together. Moreover, it can travel through the wiring to the outlets and damage electronics not plugged into a point-of-use surge protector. Because the wiring is within the walls of the property, it can be difficult (and costly) to determine the extent of the damage. If lightning travels into the home through the wiring or through communication cables (such as those used for internet, cable TV, or phone), it can cause serious damage to any electronics not properly connected to a point-of-use surge protector. Consumer electronics, such as computers, televisions, and gaming systems, all utilize an integrated circuit, which is extremely susceptible to damage from a voltage overload caused by a surge (eHow). 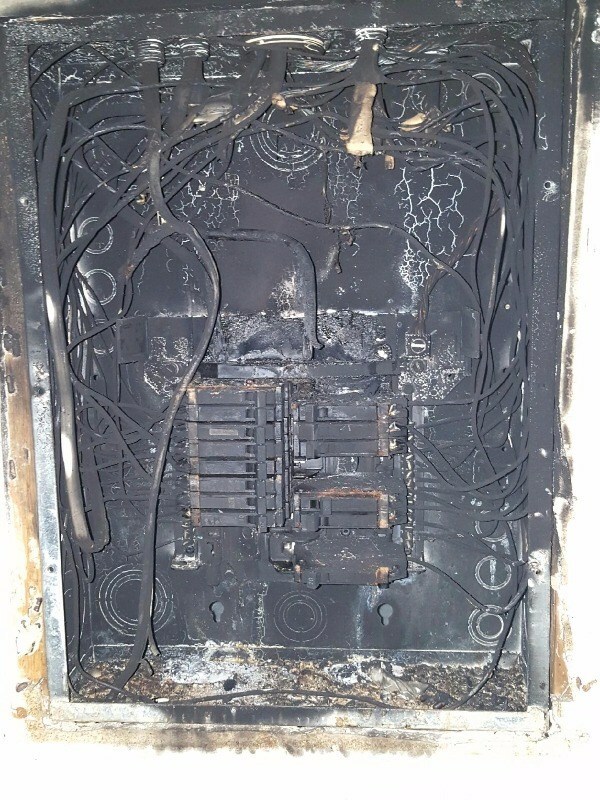 Fortunately, if these types of electronics are properly connected to a quality surge protector, they can be safeguarded from voltage fluctuations. An important thing to keep in mind is that the energy from a lightning strike can travel through communication cables that are connected to a cable box, phone, or modem. If these cables are not also properly connected to a surge protector, the overvoltage can travel into the device that it is directly connected to and damage the circuit board. Large appliances (such as a washer, dryer, range, refrigerator, well pump, water heater, etc.) are also vulnerable to surge and lightning damage. How susceptible a large appliance is depends on whether it uses mechanical or electronic controls. If the appliance simply uses a mechanical control, it will typically be able to withstand most surges without sustaining any damage. However, if the strike is directly to the building or to a very close power pole, the event may still damage the appliance (NIST). Large appliances that utilize electronic controls are much more sensitive to surge damage from a lightning strike. 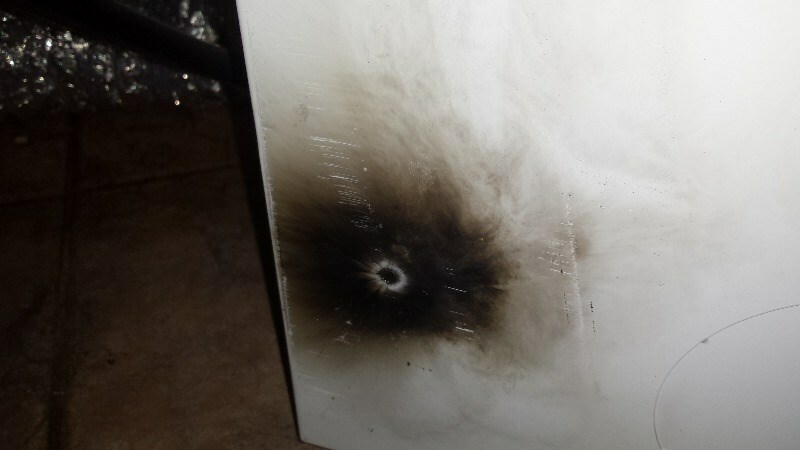 If the surge travels through the wiring to the outlet that appliance is connected to, it can damage the appliance’s control board. Pool and irrigation equipment are connected to a large surface area of pipes, which provide a direct path to the system’s electronic controls. These controls typically have solid-state components that are sensitive to voltage surges. However, specialized surge protectors can save these expensive pieces of equipment from damage. Lightning- and surge-related events can severely damage a home’s electrical system and the electronics connected to it. As the number (and value) of the electrical contents of a home increases with newly developed technologies, we expect to see the average cost per residential lightning claim to continue to rise. Additionally, The Journal of Science predicts an increase in the number of lightning strikes as the earth’s temperature warms. This illustrates the significance of insurance carriers developing a standardized method for handling lightning damage claims to better control their indemnity leakage exposure. One way this can be accomplished is by utilizing an objective expert to thoroughly investigate electronics claimed in lightning losses, to verify the cause of loss and recommend an appropriate action to return the insured to pre-loss condition. Additionally, an independent third party can ensure that carriers are only paying on valid claims. 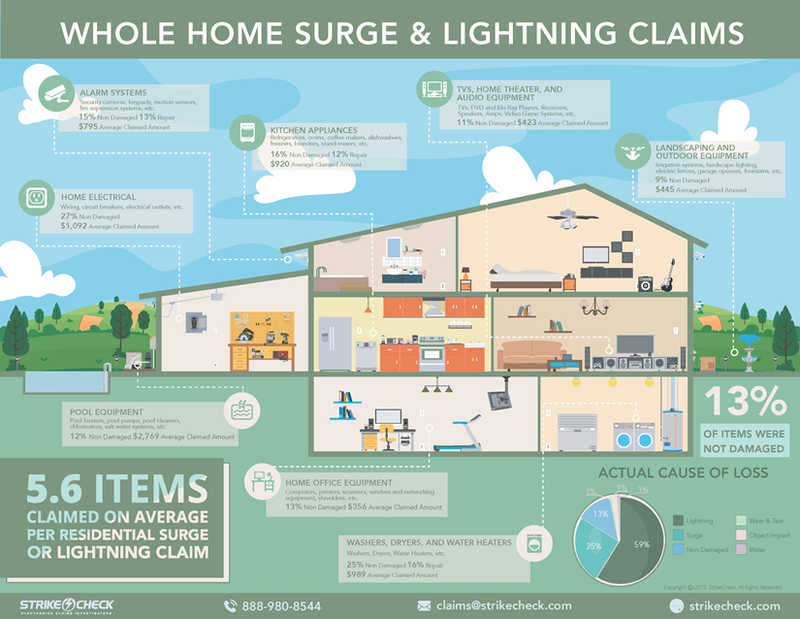 In 2016, 13% of items claimed in lightning and surge losses were in proper working condition at the time of StrikeCheck’s assessment, further exemplifying the need for a thorough investigation.